in a star-filled sky, blinking. 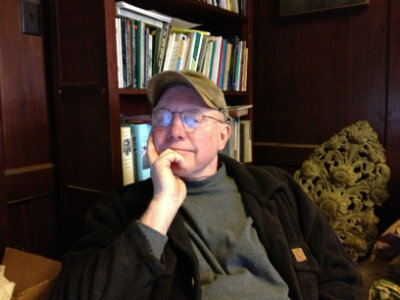 Robert Murphy’s poems have appeared in the literary periodical Smartish-Pace, as well as the Colorado Review, the Notre Dame Review, The Cultural Society, Marsh Hawk Review and the Chicago based journal LVNG. He is the author of a chapbook, Not For You Alone (Dos Madres, 2004), and Life In The Ordovician – Selected Poems (Dos Madres Press 2007). He is a 2000 winner of the William Bronk Foundation prize for poetry. Robert Murphy is also executive editor and publisher of Dos Madres Press. He is married to the iconographer and painter Elizabeth Hughes Murphy, who is both book designer and illustrator for Dos Madres Press.